The summer palace of the Würzburg Prince-Bishops, built in 1680/82, was enlarged in 1753 by Balthasar Neumann. 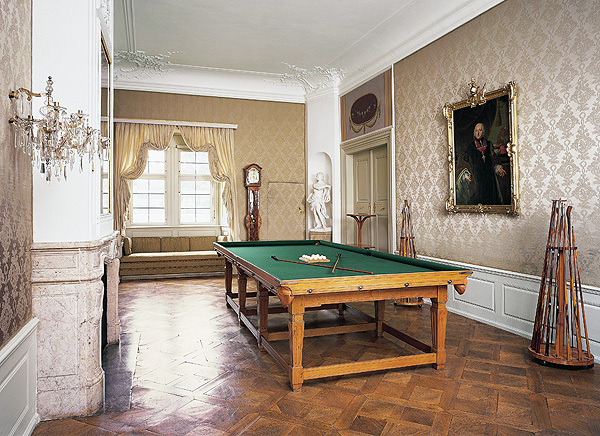 The rooms furnished in 1810 for Grand Duke Ferdinand of Tuscany with their rare paper wall-coverings are a highlight of the interior. The famous Rococo garden, a magnificent creation with lakes and waterworks, dates from the reign of Prince-Bishop Adam Friedrich von Seinsheim (1755-1779). It is populated by over 200 sandstone sculptures of gods, animals and allegorical figures by the court sculptors Ferdinand Tietz and Johann Peter Wagner. 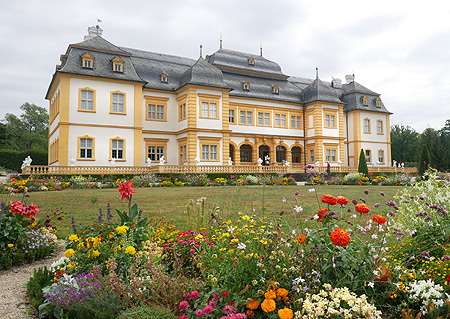 On the ground floor of the palace the exhibition "Es kommen immer Leit aus Würzburg und Frembde hierher …" on the history of Veitshöchheim Court Garden is on display. The vestibule is suitable for receptions and civil weddings up to 100 persons. The palace terrace is suitable for receptions and small concerts up to 60 persons. The rooms on the upper floor can only be visited within in a guided tour. The exhibition on the history of Veitshöchheim Court Garden at the ground floor (included in the admission charge) can be visited without a guided tour. There is an audio guide tour through the Court Garden available (with costs). The rooms are only accessible via a staircase. From Würzburg "Alter Kranen" to Veitshöchheim "Mainlände"